Beneath the Mayan jungle of Playa del Carmen lies a labyrinth of limestone caverns and underwater rivers that few will ever see. 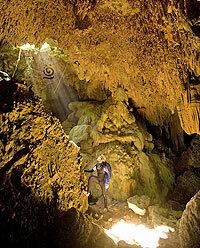 The wonders of these caves, called cenotes in Mayan, are still being discovered every day. The cenotes are perhaps the greatest natural treasure of the Yucatan, and this tour takes you there. Prepare to be amazed by the power of nature, the beauty of these creations of time, and the incredible clarity of the secret river, Rio Secreto. Our air-conditioned van will transport you into the jungle, where we'll make entry into the underwater caverns of the Riviera Maya. Donning helmets, headlamps and wetsuits, we'll explore the depths of these incredible natural attractions. We'll navigate approximately 2,000 feet (600m) of caverns, both on foot, and by swimming in the magnificent waters of Rio Secreto. Your expert guide will share with you the wonders of this area, and take you on the adventure of a lifetime, beneath the sands of the Riviera Maya. When: Three times daily at 9:00 AM, 11:00 AM and 1:00 PM. Exact pickup time will vary depending on the location of your hotel, but will be specified on your ticket. Where: Pickup at your Playa del Carmen hotel, or meet at Plaza Playacar, one block from the ferry terminal and walking distance from Playacar hotels. English Speaking Adventure Guide (Guides available in other languages upon request). This tour is offered in: English, Spanish, French, German and Italian.